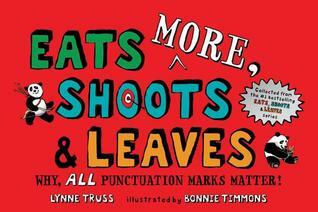 Bernie Gourley’s review of Eats More, Shoots & Leaves: Why, All Punctuation Marks Matter! Bernie Gourley's Reviews > Eats More, Shoots & Leaves: Why, All Punctuation Marks Matter! The only surprise was finding “dog’s” used as a contraction for “dog is.” I was under the impression that that apostrophization could only be a possessive (i.e. “dog’s bone” is a bone that belongs to a dog) and only specified pronouns got apostrophe-“s” as a contraction. Don’t get me wrong, I employ such contractions all the time in poetry -- mostly to preserve meter -- but poets love to infuriate grammarians. Sign into Goodreads to see if any of your friends have read Eats More, Shoots & Leaves.